Ottawa – The Ottawa 2017 Bureau and Mayor Jim Watson, in collaboration with lead partner CIBC, are pleased to announce that tickets to the Sky Lounge will go on sale at 10:30 a.m. on Friday, October 28. Ottawa 2017 is also pleased to welcome feast + revel, the signature restaurant of Andaz Ottawa ByWard Market, as the Official Sky Lounge Culinary Partner and to announce that Executive Chef Stephen La Salle will create the menu for this unforgettable culinary experience. An Ottawa 2017 Signature Event, the Sky Lounge will take flight between July 14 to 20, 2017 at Ottawa City Hall. 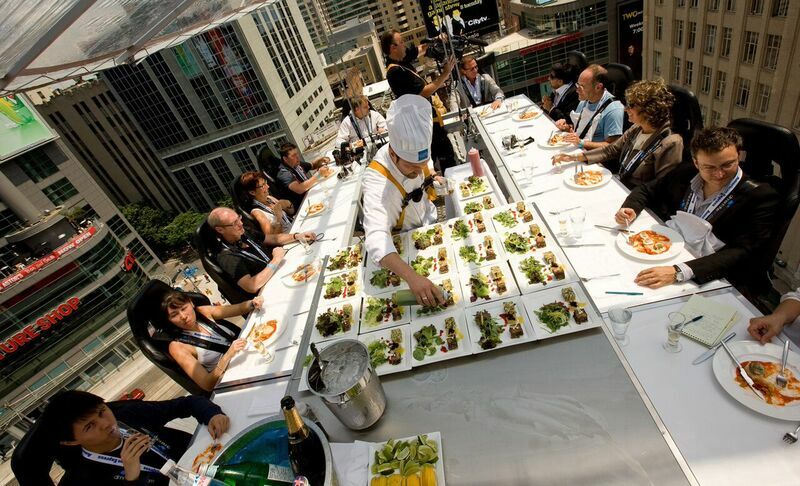 Each evening, participants will be hoisted 46 meters (150 feet) in the air over the city, to enjoy breathtaking views and fine dining. Two different culinary journeys will be offered. Tickets for the Sky Lounge Cocktail experience are $150 (plus tax and service charges) and tickets for the Sky Lounge Gourmet Dinner experience are $250 (plus tax and service charges). Cocktail seatings will take place at 4 p.m., 4:30 p.m., 9 p.m., 9:30 p.m., 10 p.m. and 10:30 p.m., while seatings for the three-course Gourmet Dinner will take place at 5 p.m., 6 p.m., 7 p.m. and 8 p.m. Capacity for each seating is 22 people. To purchase tickets, visit Ottawa2017.ca. In addition to creating the menu and providing the food and beverages for the Sky Lounge, feast + revel staff will extend their attentive hospitality to serve guests both in the air and on the ground for the pre and post flight experience.